Radiators are among the items on your bike that don't require a serious crash to ruin. In fact, it seems that even the most minor slideouts and tip-overs in corners can be among the most destructive things to them. Sadly, this can end in a leak, and the end of your riding day...along with a bill to fix or completely replace the radiator itself. In most cases, a good set of braces can save the radiators and can actually be cheaper than even the lowest cost replacements. While some radiator braces can be quite bulky and more cage-like, Works Connection keeps things simple with their design. With that said, it's time to shine a spotlight on a product we've been using for years. Formed from aircraft grade 5052 aluminum. Available in raw silver, or Factory Edition black satin powder coating (for most models). CNC billet bracket system incorporates rubber vibration mounting system. Bolt-on installation, no modification required. Available for most modern Suzuki, Kawasaki, Honda, and Yamaha models, with some older KTM options. MSRP: $39.95 - $144.95 ($129.95 as tested). The set shown in this review is about the sixth or seventh different application I've installed Works Connection's radiator braces on.For most models, they resemble an aluminum triangle that mounts to the top and bottom of the radiator and to the side of the frame. They're slim in design, following the general shape of the radiator shroud. On some models, it may take a look or two to even realize they're on. Over the years they've have changed slightly, where in the past they would use stock radiator shroud mounting locations, they now have their own bracket with a rubber insert. This allows the brace to have a little give and flex during impacts, and also doesn't create another hard mounting point that would create a more rigid feel. Depending upon the application, Works Connection does offer one option. Leaving the end user with the choice of the standard silver brace or their special edition black ones. Installation on every set I've used is quite simple, usually consisting of removing the radiator shroud, mounting the braces to the radiator itself, and then to the frame with their supplied bracket. To mount it to the radiator is a combination of bolting it to the supplied top mount (usually part of the radiator louver) and the bottom mount using the pre-existing threaded area for the bottom radiator shroud. Once all this is done, you just install the radiator shroud over the top. In some cases, you may prefer to run a slightly longer radiator shroud bolt at the bottom, to make threading it up a bit easier. Overall, there's not much to say about my on-track experiences in a negative way. The braces are almost undetectable on the bike, moving the radiator shrouds out barely a millimeter, and the only discernible difference is the flex in the shroud. If you ride forward on the bike, you might feel that the shroud are doesn't have as much "give" as stock form, due to the radiator braces frame supporting the shroud itself. In the case of some bikes, this may save the shrouds themselves from breaking after being abused and squished too often. Here's the best thing I can say for this product, I've never bent one! I've never bent the radiator nor the brace itself once equipped. While some of my experiences were limited to a couple weeks of riding on different project bikes, I did use these braces for two seasons aboard a KX450F in WORCS races a few years back...between landing in rocks, high speed get-offs, and more, nothing phased them. I think the worst damage I've caused one is a slight indent and scratch where it's exposed under the radiator shroud, after a collision with a rock. Overall, radiator braces are a no-brainer for bikes I plan to spend a decent amount of time on. The cost alone will cover fixing most radiators and is quite a bit less than OEM replacements, if it's a catastrophic case. Also, the extra thought Works Connection put into the rubber mounting eliminates the one slight dig on this product one could have and there's not much of a reason to say no to a set. For the added durability, and a fairly easy to swallow price, it wins out with the first five star review I've ever handed out. We just wish they were available for modern KTM/Husqvarna needs. For more information and a list of applications, head over to WorksConnection.com. 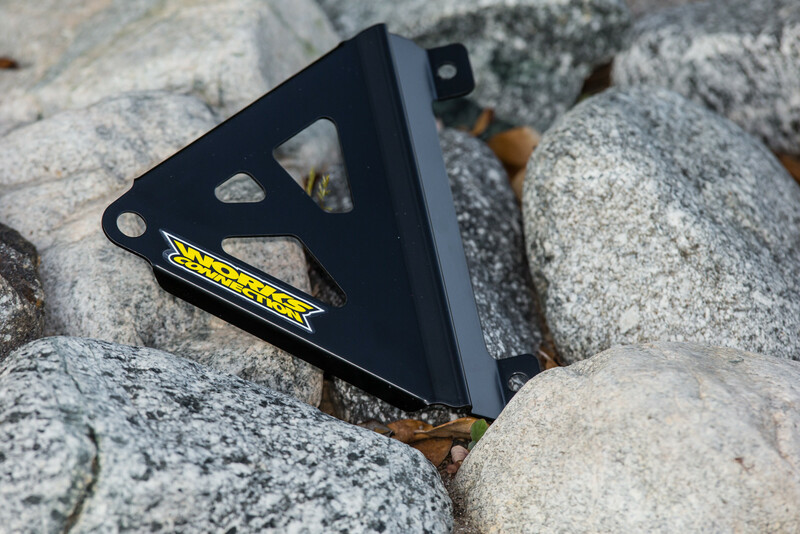 Works Connection built their Radiator Braces out of aircraft-grade aluminum to provide a lightweight yet durable way to provide support to your motorcycle's weak radiators.